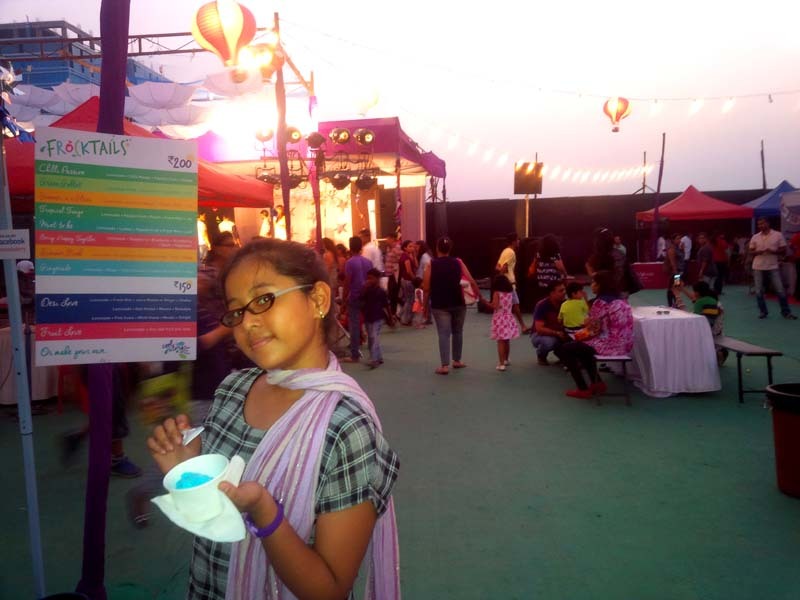 Yesterday was Nov 14th (2015) celebrated as Children’s Day and Hindustan Times (alongwith sponsors) came up with the interesting idea of having a festival for children which would wean them off television and mobile phones and allow them to participate in various workshops and activities. 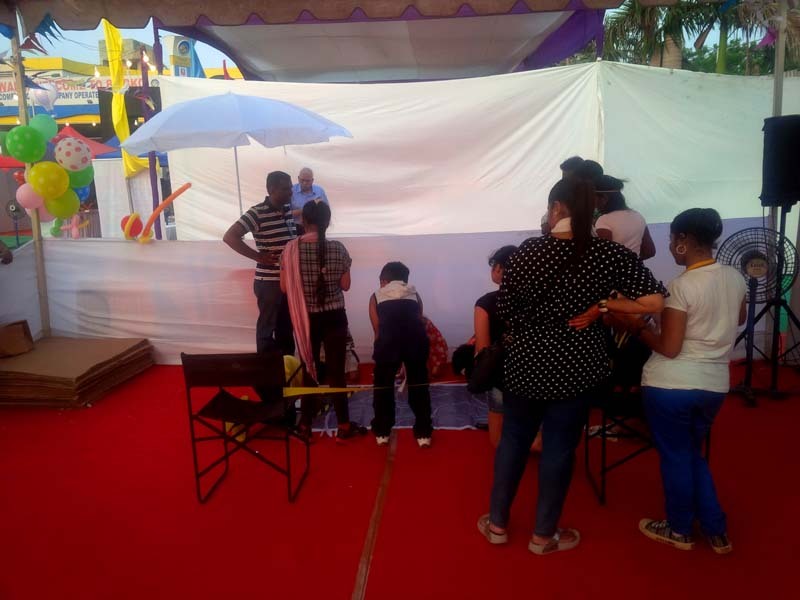 The event, titled #Happifest (located at the MMRDA grounds in BKC) is scheduled to run over 2 days – Saturday and Sunday (Nov 14 and 15) and has different activities planned for both the days. I went for the first day with my 11 year old daughter to see if the event was as good as I was hoping it would be. Interesting adventure sports for kids to explore – ziplining, rock climbing, Burma bridge. A radio station for kids where they can try their hand at being RJs. GoCheese had sponsored a group of kids form an NGO to enjoy a different set of activities, which was a real nice gesture. Nothing other than the radio station is air conditioned, so the 12 noon start/activity time is insane. It shoudl have begun by 3/4pm and gone on till 10 pm. Barely any shade in the seating tables at the food stalls. Overpriced food and extremely over priced water. For those not used to mobile toilets, it could be a tad difficult to adjust. There is no “free”/drinking water publicly available and you are encouraged to buy the expensive water bottles. However I did find a water filter which was tucked away and not easy to find. Definitely not a fair business practice. Here comes the biggest negative from my side…for an event scheduled to start at 12 noon in the blazing 37-38 degree celsius heat, I had expected it to be within air conditioned tents but surprisingly it was all open air with no air conditioning to speak of, with everyone scrambling to get into whatever pitiful shade the tents and partitions provided. While adults could handle this, I’m not quite sure its a good idea to have kids baking in this unseasonal heat wave. After initial reservations about whether to carry on or turn back, we decided to go for it since we had come all the way anyway! The cap I always carry made it bearable while my daughter had her wrap around scarf thingy (sorry I’m not very good with the fancy names women’s clothes go by) As we moved it, we were lucky enough to find that the only place that was air conditioned – the WeKids Radio station, was beginning registrations! Since me and my daughter have always had a love for music/public speaking, it was a no-brainer that we would head off to try our hand at being an RJ. 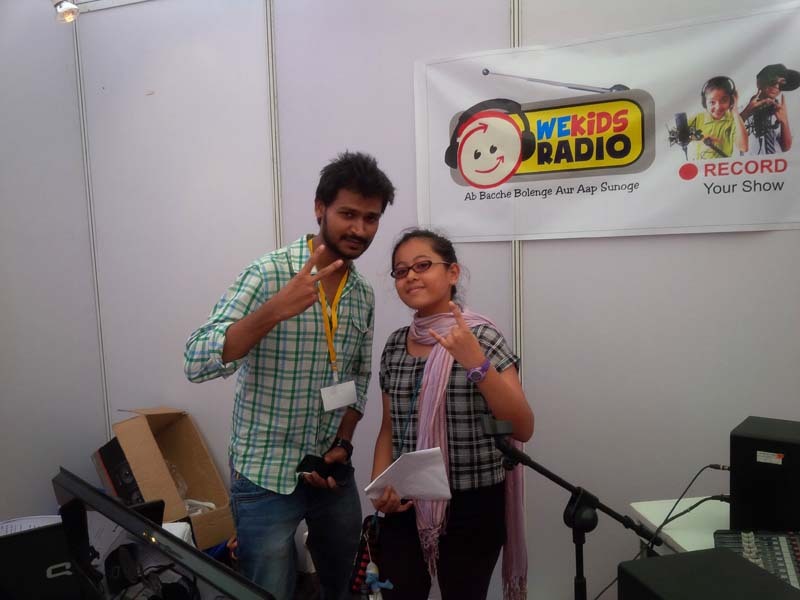 This for me is the coolest stall on the grounds… registration is Rs.500 (for the child only not the adult) and in return you will get a professionally mastered recording of the RJ show that you did. The child can choose from three scripts – Me and My Cool Life, Interview with Father and Interview with Mother. The radio station is run by Shantanu Joshi – the hindi voice of Mickey/Spongebob et al and he does a great job at explaining the microphone and voice modulation. I would highly recommend this … me and my little one absolutely enjoyed it. By the time we were done, it was 2:30 pm (after about an hour in the A/C studio) and we went off to grab something to eat. There are a number of food stalls selling interesting food stuffs, Pita Burgers, Delhi Chaat, Macaroons, Belgian waffle, Noodles, momos, Pizza, Greek Yogurt and water bottles as well as cold drinks (only Rio cans) Now this is the second negative about the festival. The food is not exactly cheap with everything in multiples of 50, with probably the Cheese Pizza being the most value for money priced @ Rs. 200 + 50 for 2 toppings. The worst is the compulsion to buy water bottles that are overpriced at Rs. 50 each! Also beware – food coupons are different from water coupons, so if you have bought food coupons factoring in the water bottles, you will have to shell extra. You also cannot return unused coupons for cash and will have to spend them all, so only buy the amount you need. The entire left bay of the area is divided into four large tents that are colour coded with seating areas between each tent for parents to sit and wait. Various workshops are conducted inside each of these tents with the tickets available at tables/counters just outside each tent. 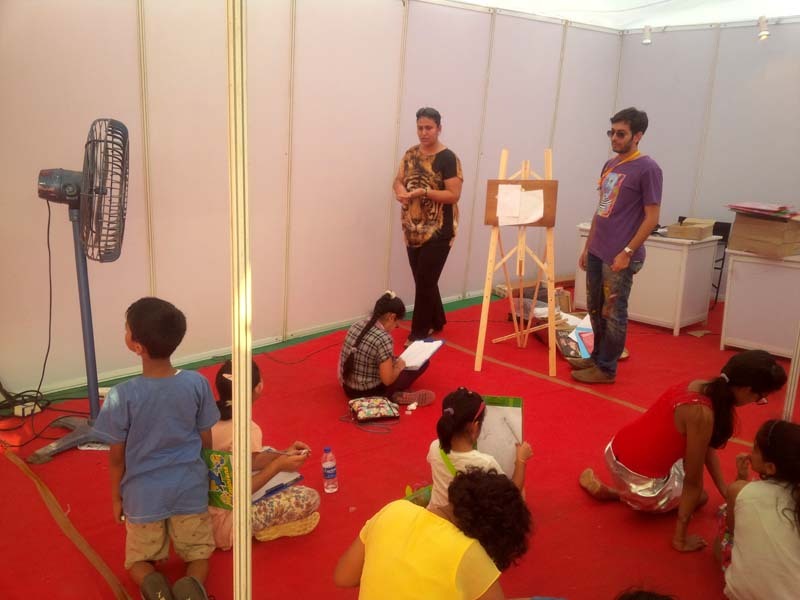 The workshops vary in price from Rs.150 to Rs.250 and most are value for money. Each workshop area does have adequate large fans to at least make the heat bearable but making sure the child and parent come dressed for summer will also help a lot! The central bay is the area for food stalls, while the right bay is reserved for various stalls that display wares from trinkets to children’s quizzes to education to toys. My daughter found a stall where she got a #MonsterHigh doll (@ 25% discount) – Ghulia Yelps, which was pretty rare and insisted I mention it in my entry for like-minded kids searching for such “deals”! Crowning the ground is the main stage which had various dance performances throughout the day, from Kidzania dancers to professional dancers, kids and many more. To the left of the stage is a covered area which houses the portable toilets for men and women and to the right is an adventure sport area which has some very interesting installations, such as the rock climbing wall, the zip line and tight rope walking/Burma bridge. There is also a lane beside it where kids can try their hand at Segway rides. Back to our session, my daughter did 3 workshops – fantasy creatures (which she loved) , Shutterbug (which she did not much enjoy… it was mainly explaining about the camera modes and nothing about creative photography… perhaps that’s all it was supposed to do!) and the final one was a Junior Sherlock workshop where the presenter explained about fingerprints and investigative techniques and then had the kids investigate a mock crime scene. The workshops are all of an hour long duration and begin from 3pm till the last one which begins at 7 pm. The weather starts getting cooler by around 4 pm and that is the time I would recommend getting to the festival. There are a lot of interesting workshops, some that took my fancy are the one about Composting, Gardening, Frozen science (freezing things using liquid nitrogen and other crazy stuff) and another about learning to understand music beats and move according to it. There is also a Yoga with Moms workshop , which I obviously was not qualified or interested in! That pretty much covers all of it, I will not be going on Sunday since I have prior commitments, but I would definitely have gone for a couple of hours in the evening to attend some music workshops for later. All in all, I would recommend this, but just about. Its definitely a nice idea but the execution could have been better and the pricing SHOULD have been lower for all things in general.